Also, something else of interest, if you are one of the people looking for assembly for your board, when you get your initial invoice just message/email me to let me know and I'll adjust the invoice. A couple people have already mentioned it in the form and contacted me, and I want to be sure I get to everyone that wants it. Assembly will be $25 for just switches(supplied by you) and +$8 for in-switch LEDs. Details will be worked out in email on a case-by-case basis. Will the pcb fit ZZ96? Looks like it will according to the standoffs in the case. Purple - 60/100, 50 MOQ hit! Matte black - 77/100, 50 MOQ hit! Black - 48/50, 10 MOQ hit, 25 unit price drop hit! White - 46/50, 10 MOQ hit, 25 unit price drop hit! Middles - 119/60, 15 MOQ 30 unit and 60 unit price drops hit! Hipro - 40/60, 15 MOQ hit, 30 unit price drop hit! GMK Stabs - 126/100, pushed to MOQ! It is really great to see interest in affordable custom keyboards. This initiative takes the keyboard to its roots: afordability, efficiency and convinience for computer input needs. Worked with an extremely helpful PayPal service rep to get a workaround for the currently issues they're having, so I'll begin on the sorting and conversion process today and invoice should start being sent tomorrow since I have to go to my brothers' performance tonight. I'm leaving the form open while working on the invoices in case any stragglers want to get in. Invoices should be sent now. Be sure to let me know if anything is incorrect before you pay it so I can still edit the invoice. Shipping will be invoiced when stuff is ready to ship out since some design changes have made the weights a little different. For the few of you that have ordered them, Red and Yellow plates will also be produced since I was able to wiggle a little bit to be able to order them. Just got my invoice but it didn't include shipping. Is that going to be charged later? Paid! Super exited for these. Glad red and yellow plates are being made too. Got the invoice but had a quick question. I noticed the middle layer wasn't being shown, Thought it did show 1 Case Kit Which could be the middle. I wanted to double check thought. Case kit includes the middle piece like it did on the form submission. Re: [GB] budget96 - Invoices Sent! Sitting at 33 unpaid right now with 2 drops so far, not bad so far. I've talked with a couple people about some delayed payments so that's no biggie. Hoping to have all payments and be ready to start placing orders by the end of next week. Right now the order priority is PCBs and acrylic layers since they seem to be what's going to take the longest. 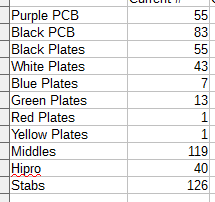 We've actually got quite a few more PCBs than the manu anticipated, so right now the estimate on their production is 20-30 days, but that might go up. I'm also ordering another set of proto plates later today to check all the cutouts for the compatible layouts and to doublecheck that our mounting solution for the countersunk screws isn't going to cause any issues. 23 unpaid right now. Reminder that the technical due date for payment is tomorrow, so please remember to pay. Also a reminder that dodging invoices makes you subject to my terms and conditions page linked in the invoices, which may include blacklisting from future invoiced sales and GBs I conduct. The shipping fees to Canada will be 17$? Or higher? We actually got 8 orders for Canada, so I'll be looking for a proxy to help keep shipping costs down. Should also help with customs fees and such as well. What’s the good word? Everybody pay up?? 12 currently that haven't paid. I'll begin aggressive reminders while working on the 2nd round of invoices on the few late submissions. I got mine paid up and am now super excited. I am thinking might get some extra Mod-H switches or do some DIY switches ((First set)) for this board. I been given some thought to transplanting Burnt orange springs into some linear's. How will non payment affect price points? If at all. So, did they pay? How will that affect? Non-payment of those invoices will at most affect numbers slightly on some of the plates, but I will keep everything as it is for those who paid invoices even if that happens. An additional reminder that invoice dodging puts you on a blacklist for future sales from me, as per my terms and conditions linked in the invoices. Do you have and estimation date when will you be able to ship? Hope you got mine I paid it a few days ago. I am sure you did and yea invoice dogging is kinda crap. The least they could do is contact you to let ya know something came up. I'm tolerant of people that will take the time to contact me to tell me something's up and they can't pay or need an extension, but I have no patience anymore for people that can't be bothered and just ignore the invoice. I used to think it pretty harsh when I saw artisan makers doing it, but after long enough dealing with people like this I can completely understand it now. Yeah, it's pretty impolite. The GB is like an agreement between 2 sides, and both sides should honor their part in the agreement. I hope it won't affect too much in your finances. I terrible at build logs, let alone pictures. But I happy to help your with any questions during your build. Alright, good news:bad news time. Good news: the most recent protos are here for testing the cutouts for all of the possible layouts. Haven't be able to test them just yet though. Bad news: the quality of the plates is absolutely the worst I've ever seen on PCBs. If you want to see the damage, check https://imgur.com/a/lKlwRHB. I'm contacting them to see what they say about it and hopefully this isn't indicative of what to expect during the GB. Second round invoices will be going out here shortly. They'll have a one week deadline. We still have 11 unpaid invoices. I will be starting aggressive reminders until the second round deadline before removing those orders and blacklisting the emails. Some bits are already in like the bumpons for the cases and the washers for the stabs. As soon as invoices are paid I can submit the orders for the other components. Wow! hopefully that is just them sending out samples for layout purposes and not indicative of whats to come!!! Damn. I explained that album to be like 3 or 4 pics. But it went on forever! Whats the plan if the manufacture say's thats as good as they will promise quality wise? Would you look for another manufacture or just go with that one and hope for the best. JLC claims they'll do their best to avoid these issues in the future. I'm hoping they do, because the extent of the issues on these protos is inexcusable but changing manufacturers isn't really an option currently. The next cheapest PCB fab would be 64% more expensive than JLC, bringing the cost higher than I can afford and higher than I want to charge anyone. Starting tomorrow I'll be beginning submitting orders to relevant vendors and fabs, though it is a weekend so there won't be immediate responses. The invoices that were notably overdue and repeatedly ignored have been cancelled and the recipients blacklisted. Do you think the group buy is still on schedule to ship out by the end of June? It's more likely to be closer to the "mid July" part of the date range I initially gave. I've no doubt plates will be a quick turnover, but getting the cut parts from JOlimon will take some time as well as PCB production, and I've run into a potential delay with GMK since emailing them about the stabs returned an automatic reply that my contact won't be back in the office until July 5th. Hopefully this might be a mistake, but if not it could certainly be a hindrance. I was just seeing on the HS60 GB that the GMK stabs were causing delays. Don't have any recommendations, but more as an FYI. Orders for the acrylic middles and hipros has been placed and paid for with materials for them currently on order. Requested an invoice for stabs but nothing back yet due to the situation mentioned previously. I'm currently talking with my PCB designer to work out the last details for shipping cost and numbers ordered. I'm also adding some samples to the order for the other layouts the designer has available so I can evaluate them for future budget-series boards. Bumpons and stab washers are already on hand. I love hearing that you're looking at more budget boards. Between the Contra and this, I'll be racking up quite the collection! I would still very much like to see a split spacebar version of a 96 board or full 104 or TKL for that matter. 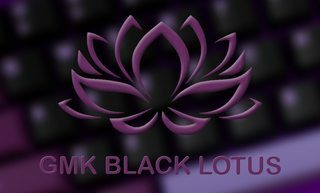 would love to see a budget TKL and a semi budget carbon fiber TKL would be amazing. I know there only so much cost savings with carbon fiber but would be nice. Page created in 0.173 seconds with 71 queries.